Scour Evaluation Of Tidally Influenced Bridges (OR) | WEST Consultants, Inc. 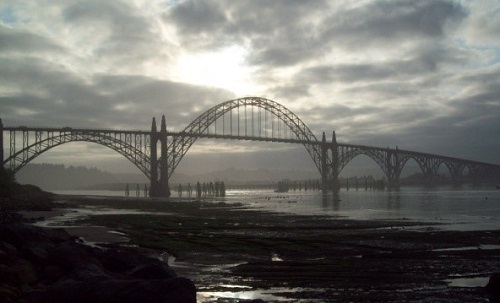 The State of Oregon Department of Transportation (ODOT) was mandated by the Federal Highway Administration Agency (FHWA) to assess scour potential and assign a scour vulnerability code for nineteen (19) tidally influenced bridges along the Oregon Coast. WEST Consultants was contracted by ODOT to complete the scour potential evaluations. As part of this project, WEST conducted site reconnaissance, collected and reviewed data, coordinated survey efforts, developed 1-dimensional unsteady state HEC-RAS hydraulic models, developed 2-dimensional hydraulic models (using RMA2 or AdH), estimated bridge scour using procedures described in HEC-18 and the ODOT Hydraulic Manual, evaluated the adequacy of existing erosion control revetments due to hydraulic and wave forces, assigned scour vulnerability code using ODOT code and National Bridge Inspection Standards (NBIS) code, and prepared technical reports. When necessary, recommend measures to maintain foundation stability were designed.